On 12 July 2018 in the State of Palestine, 8-year old Hamid looks out over the old city of Hebron from the roof of his house. Checkpoints punctuate Hebron’s old city, part of the area known as H2, and affect the movement of people, including access to education as many children must pass one or more checkpoints on their way to school. In a joint statement, the UN Humanitarian Coordinator in the Occupied Palestinian Territory (OPT), Jamie McGoldrick; the Head of the UN Human Rights office (OHCHR) in the OPT, James Heenan; and the Special Representative for the UN Children’s Fund (UNICEF) in the State of Palestine, Genevieve Boutin, said they were “deeply concerned” by continued reports of “children killed or seriously injured, some as young as 11” in Palestinian-administered areas. They also denounced the fact that “children in Israel are exposed to fear, trauma, and grave injuries”. “This month alone, seven Palestinian children were killed by live ammunition and shelling from Israel”, they said, adding that “two Israeli girls aged 14 and 15 also reportedly sustained injuries from rockets and mortar shells indiscriminately launched by Palestinian armed groups towards Israel”. According to figures provided by UN agencies in the region, since the start of demonstrations at the border fence against Israel’s longstanding blockade and deteriorating living conditions in Gaza on 30 March, 26 Palestinian children have been killed. 21 were shot during the demonstrations, and five others were killed by Israeli shelling, or outside the context of demonstrations. In the same period, hundreds more children have been injured by live ammunition. “Families cope with four hours of electricity per day in the sweltering heat, clean drinking water is expensive and hard to find. 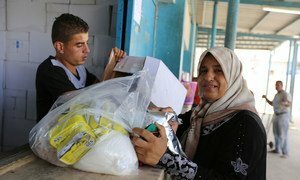 The start of the school year in one month will be very difficult for tens of thousands of families who cannot afford basic school supplies,” said the three UN officials. In addition, they deplored the “too often cynical use of children in political rhetoric and propaganda on all sides,” citing last week's call by the organisers of the ‘Great March of Return’ for Palestinians to demonstrate under the banner of "the Friday of our Child Martyrs" and the reported exposure of children to violence. “Children should never be the target of violence and must not be put at risk of violence, nor encouraged to participate in violence,” the joint statement read. “We call on Israel, as well as the Palestinian Authority and the Hamas authorities in Gaza to put children’s rights ahead of any other considerations and to take immediate steps to alleviate their suffering,” said Mr. McGoldrick, Mr. Heenan and Ms. Boutin. “Respecting the rights of children and refraining from instrumentalising their plight should be a priority for all”, they insisted, stressing that the Israeli-Palestinian context is “not an exception”. On 23 July, the UN High Commissioner for Human Rights, Zeid Ra'ad Al Hussein, briefed the UN’s Committee on the Exercise of the Inalienable Rights of the Palestinian People, on the many human rights violations facing women, children and men living in the OPT. 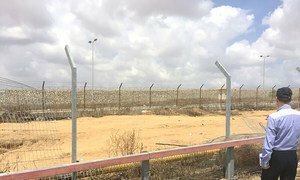 Following further restrictions on goods and supplies that can be moved across the border of the Gaza Strip, the top United Nations humanitarian official there has called for urgent measures to prevent an already critical humanitarian situation from getting worse.